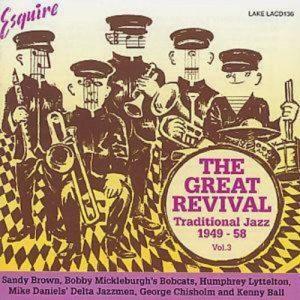 Among his many projects for his Lake label, years ago Paul Adams acquired and reissued most of the British trad jazz recordings that were originally put out by the Esquire label including the five CDs in his Delving Back series and the five CDs covered here in a series titled The Great Revival: Traditional Jazz 1949-58. Each of the latter features several bands from the prime years of the British trad movement, providing early glimpses at some major names along with sessions by forgotten but worthy bands of the period. In exploring the British trad boom of the 1950s, one is struck by the sheer quantity of excellent (if sometimes now-obscure) recordings, and the variety which ranges from 1920s jazz and Chicago-style Dixieland dates to small-group swing and sessions that are closer to the music of Bunk Johnson and George Lewis. Vol. 1 in this series focuses on Bobby Mickleburgh’s Bobcats, the Tony Short Trio, Cy Laurie, and the Christie Brothers Stompers. Mickleburgh was an exuberant trumpeter who leads a hard-driving sextet, pianist Short performs two numbers with a trio that includes clarinetist Pip Gaskell, the Johnny Dodds-inspired clarinetist Laurie is featured with two different groups (including rare titles from 1951 with a quartet that includes trumpeter Les Jowett), and the Christie Brothers Stompers (also from 1951) is represented by eight somewhat ragged ensemble-oriented numbers with the future star Ken Colyer on trumpet. Vol. 2 has a variety of exciting numbers from clarinetist Brian Woolley’s Jazzmen, two more hot sessions from Mickleburgh’s Bobcats, four selections by cornetist Mick Gill’s Jazz Band, a version of “Eh La Bas” from the Crane River Jazz Band (which includes Colyer and clarinetist Monty Sunshine), and clarinetist Acker Bilk’s first studio session as a leader, a primitive set from 1955. Vol. 3 has two more sessions by Bobby Mickleburgh’s Bobcats but one with the leader switching effectively to trombone. Also included are dates that give listeners early glimpses into the playing of clarinetist Sandy Brown, trumpeter Kenny Ball (on two numbers led by veteran trombonist George Chisholm), cornetist Humphrey Lyttelton (“Panama” from 1949), and cornetist Mike Daniels’ Delta Jazzmen. Vol. 4 starts out with a particularly well-conceived session by trumpeter Les Jowett’s Jazz Seven that has inventive frameworks and very individual soloists. Also included are the first two studio sessions of the still-active trombonist Chris Barber along with spirited sets by the Second City Jazzmen and the Merseysippi Jazz Band. Vol. 5 is one of the strongest CDs in the series with Kenny Ball heard on his first studio recordings as a leader, and early titles from singer George Melly, clarinetist Terry Lightfoot, Acker Bilk, and Chris Barber. Because the Lake label has stopped releasing new sets, now is the time to fully explore that label’s impressive output before The Great Revival 1949-58 series and other CDs in their catalog become scarce.